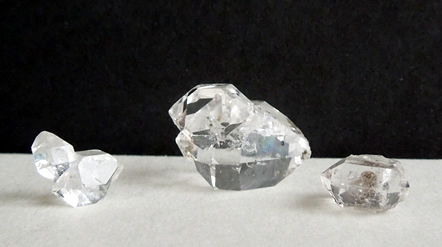 This is a group of three different types of natural twin, or twinning crystals. A twin crystal (also called twinning) is recognized as two individual quartz crystals that have grown together to the extent that they have merged, but terminated separately. Twinned crystals may be contact twins or penetration twins. Contact twins typically have grown side to side and share a common facet point. With penetration twins the individual crystals grew point to point, as though they are passing through each other. 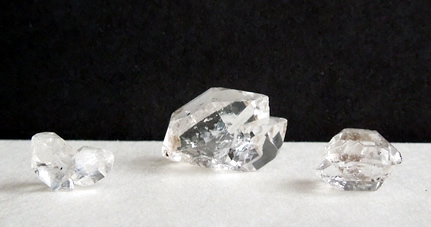 The largest, pictured center, measures 20x13x13 mm overall / 16.8 ct. It is a penetration twin, with a 13 mm Herkimer who's point grew into the 18.75 mm crystal, resulting in one single point on one side and 2 points on the other. It has excellent clarity and strikes a rainbow where the two quartz crystals come together. 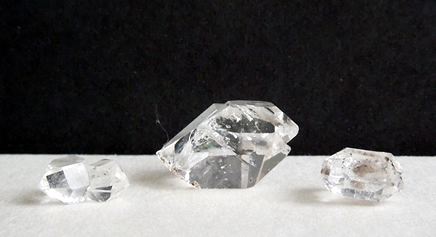 The natural contact twin, pictured right, measures 11.25x10x6.25 mm / 4.4 ct. 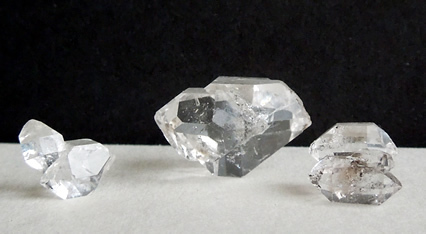 The crystals attached side to side resulting in 2 double terminated Herkimer's. The third, measuring 12x8.25x5.25 mm / 3 ct. overall, and pictured left is technically a triplet, not a twin. A 10 mm and 7 mm crystal naturally joined at a 45° angle at one tip. Nested here is a 2.5 mm double terminated baby. Twin crystals are used in the metaphysical community to promote loving contact, help find our soul-mate and promote togetherness. 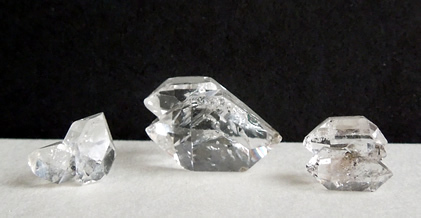 These are quality specimens with good definition and smooth, clean facets and tips. 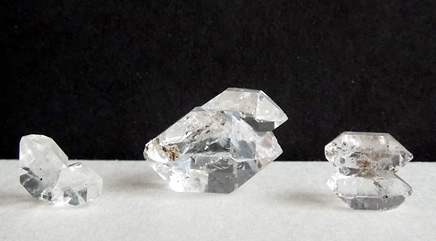 Three natural twinning, or twin crystals.